Rich Hill is one of the most famous as well as interesting sites for gold mining in the US in terms of both quality of large gold nuggets that have been found as well as the overall quantity of gold produced. For nearly 150 years, gold has been coming from the gulches and washes in and around Rich Hill, especially along the Antelope and Weaver Creek areas. Even today, people come from all parts of the world with their drywasher and metal detectors to find nuggets of gold in this area. This area is extremely popular during the winter months, when thousands of “snowbirds” come to the areas to spend the winters. The district is located just east of Stanton and north of Octave where the gold was found in large amounts. Early prospectors to the area found the gold on the surface under boulders and rocks while the stream beds contain an impressive amount of gold amid the gravel. A group of prospectors led by Captain Pauline Weaver discovered gold in the Rich Hill area in 1863, about the same time that gold was discovered in the Lynx Creek area as well. Some reports indicate that the initial findings of gold were made by a Mexican in the party that found a loose pile of it atop Rich Hill itself while looking for a stray animal. The excitement at finding the gold quickly brought in new prospectors who managed to pull over $100,000 worth in just three months time. The gold discovered ranged from small grains to large nuggets that were worth hundreds of dollars at the time. Within five years, about half a million dollars worth of gold was mined from the area. Rich Hill is part of the Weaver Mountains in Arizona. The actual Weaver placer area covers about 40 square miles, but additional gold bearing areas can be found many surrounding areas all around here. One of the richest finds was near the top of Rich Hill and the sides flowing from Antelope and Weaver creeks. It was called the “Potato Patch” in recognition of the huge potato sized nuggets that came out of the area. Over the years, there has been a great deal of mining in the area that has ranged from single persons with a few tools to large mining operations. The typically equipment used in the region includes drywashers, pans, rockers and sluices along with dry-separators and power shovels to scoop up the gravel. One of the most popular tools to find gold here is the modern metal detector. People still routinely find gold nuggets with a metal detector even today. Gold is still being mined on a daily basis in the Rich Hill area, although discoveries of new gold are obviously fewer and farther between than over a century ago. Most mining activity occurs during the winter months, when the weather is more agreeable. Undoubtedly there is still plenty of gold to be found given the unique nature of the area and the amount of gravel and streambeds yet to be fully mined. It is worth noting that Rich Hill is probably the most well-known area in Arizona to gold prospect, and because of this almost all of the gold bearing ground is claimed up. Additionally, there are patented mining claims and private property in the area as well. If you are new to prospecting or are just looking for a place to go look for gold around Rich Hill, it is highly recommended that you contact some of the gold prospecting clubs in the area. There are many different clubs in Arizona that have mining claims that can be mined by members. 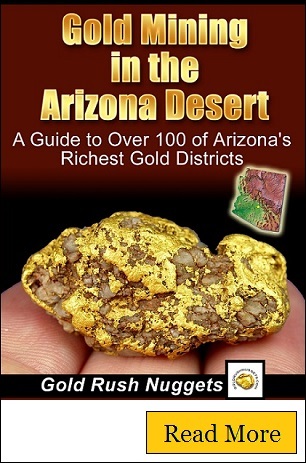 This is a great way to gain access to gold bearing areas around Rich Hill and other popular mining areas in Arizona.